The historian English cricket Stephen Chalke tells the story of when Geoffrey Howard, an English cricket administrator, set off from London on the boat train for the docks at Tilbury, to manage an MCC cricket team to India in the English winter of 1951-2. There was not much in the way of travel security or any briefing from Lord’s, the home of English and at that time world cricket. Howard recalled in old age that as his train was about to depart, Col RS Rait-Kerr, a reactionary official at MCC, put his head through the window into Howard’s compartment: “Good luck, old boy,” he said, and made a derogatory remark about ‘educated Indians’ (namely; that he couldn’t stand them). Howard had never managed a touring team before; indeed, had never been on a cricket tour. Yet such tours to India were already notorious for food and drink causing stomach upsets and worse. Travel Security Handbook by Sven Leidel shows how far we’ve come since those days when Britons could blithely assume that they would be safe because they were British. Some things haven’t changed; how travellers and the firms or governments that send them abroad assume that all will be well, whether because of the lure of going somewhere different, or because the traveller assumes that someone (the corporate employer, his government) will pull them out of any trouble; that they know what they are doing by giving them the ticket to wherever. The fact is, as Leidel says at once, ‘the dangers for travellers abroad have increased considerably in recent years’. And not only because of acts of terror; but assaults on travellers, for theft or kidnap for ransom. Know the risks, take them seriously, and you can learn to deal with them, is the book’s motto. Leidel opens with definitions, and what training you might seek, and how (online for convenience, for instance). He runs through what to do before the trip and during it - and not only in case of security threats such as robbery, but such banal yet real things as colds, flu and malaria. Leidel covers plenty of ground, well set out to be readable, whether advice for the woman traveller, insurance, what to do in various emergencies, or what to do in a hotel or while travelling. If I have a quibble, and it doesn’t even rank as a criticism, it’s about a choice of order in the material. An appendix has a ‘top five’ common crises while travelling - namely, falling sick, losing your luggage, getting robbed, having an accident, or being affected by terrorism or civil unrest. Other appendices offer the basics in a few pages. These could do with being at the very front, flagged up if someone doesn’t have the time or patience to go through the whole book, well signposted though the material is. That said, the book covers plenty of angles, and it makes a welcome change to have a work on security management in English from a German (in 2014 he brought out a similar handbook, in German, Handbuch Reisesicherheit). This book gives the Continential perspective, when so often security management books are by and for North Americans. In any case the most dangerous countries in the world (Leidel goes through them as Somalia, Sudan, Syria, Nigeria, Pakistan, Yemen, Mali, Afghanistan, Iraq and Mexico) include some substantial places. 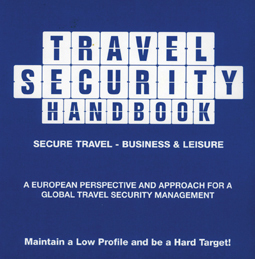 To sum up, Leidel offers all the business traveller or tourist ought to consider on the safety and security side, from such small but useful tips as leaving a light or TV on when you leave your hotel room, to deter burglary, to advice for corporate security departments, for example on emergency planning.